One of the reasons I haven't been posting as much as on this blog as I usually do is because I've been working on my new radio show on Viva Radio. Unwritten by American Apparell, Viva gives its contributors the freedom to play whatever they want. My show called Cultures of Soul, is just that. I search for the rarest soul, jazz, funk, disco from all over the world. I play Brazilian funk, latin disco, ethno jazz, and much more. 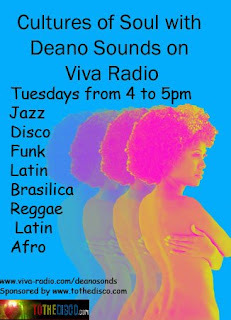 Check it out on Viva Radio on Tuesdays from 4 to 5pm or check it my archived shows here. I've teamed up with my long time friend and DJ partner Jay Murphy for a new night of soul music specializing in deep funk, northern soul, sister funk, and everything in between. The night is starting to take off so come show off your favorite soulful dance moves. 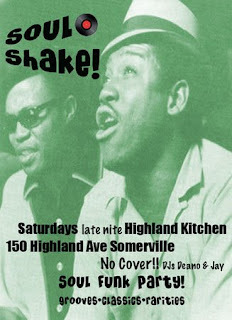 It's every Saturday night at the Highland Kitchen at 150 Highland Avenue in Somerville. You can do a lot of dances to this mix and you may even be able to do the cumbia. I don't know I just liked the way Deano's Cumbia sounded. It's got some latin, salsa, brazilian, afro beat, and cumbia funk.